The Bicycle Circus is Coming! 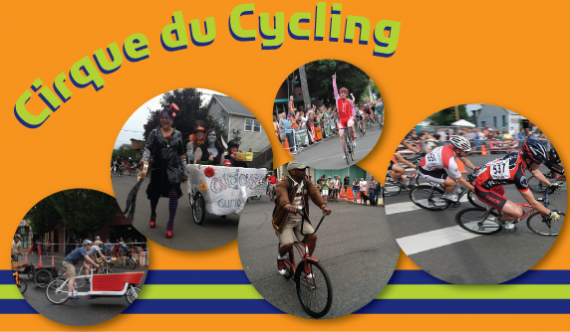 On August 9, plan to spend your evening on Mississippi Avenue for Cirque du Cycling, a bicycle street fair like you’ve never seen before. This cool event is free to watch, free to participate in (except for the race) and activities take place from 4:00-8:30pm. This year’s event features a new and improved course that buttonhooks at the top of Mississippi. Prost is positioning their beer garden directly above this exciting turn in the course, making for great viewing atop the hill. Sip your beer, chat with your friends and watch racers grind their way up the hill then zoom all the way down. Click here for a Downloadable PDF with a full-size view of the racing course. Cirque du Cycling takes place on Mississippi Avenue between Shaver and Fremont. Biking to Mississippi is the way to go on this fun summer day. Car parking will be limited and the event will be crowded. Bike parking is free, abundant, and located on Fremont right near Mississippi (next to Flavor Spot).